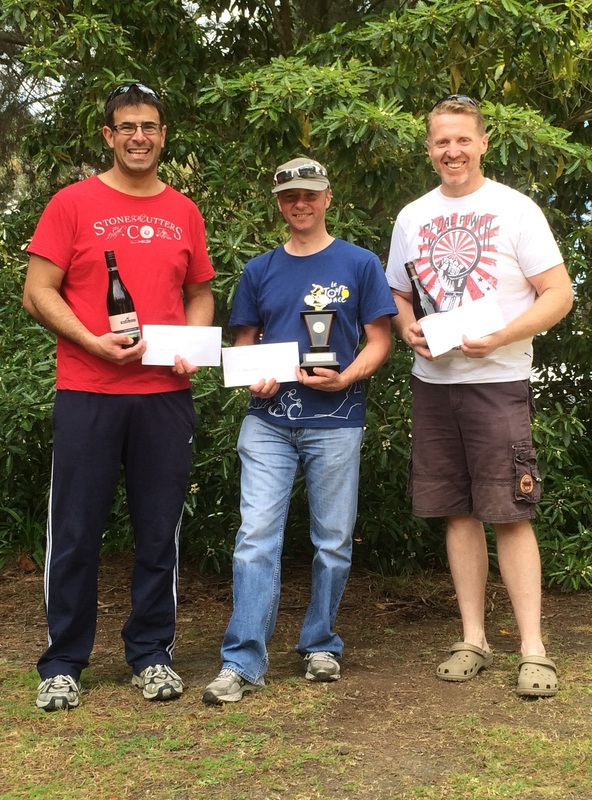 Congratulations to Pete Livitsanis on 3rd place in the 2014 Geelong Open (October 5). Scott Denno finished close behind in 4th and Brad Eppingstall finished 7th. 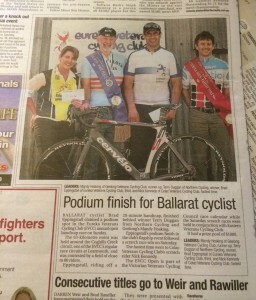 Thanks to the Geelong Veterans Cycling Club for hosting a great event. Depart 0700 from Terry’s (Ray, Richard, Darren, Shaun and me). Extra ice in the little esky to keep the biddons cool. Up the Calder and we arrive in plenty of time so check the program. Eureka has 15 starters, that’s good, a quarter of the club is here. Maz, Lisa and Ray have 35:00 and eight in their bunch. Everything is quite normal – the start is delayed while they sit on the start line waiting for the ambulance. It is somewhere in the general area on a dirt road and on the phone. All is resolved in due course and we are away. On 16:00 mins we are chasing four and a half minutes to Allan Barnett, Tony Lloyd and the 20:30 group with Graeme Parker on 26:00. We are unlikely to catch the group in front and Matt Ritchie and Mal rock are only two and half minutes behind. Early on, here is Graeme Lockwood and another bloke, dropped, but the rest cannot be seen. On schedule the 13:30 group catch us at Newbridge – no wonder as riders who are not working will not talk and let us know they are not coming through so you end up chasing a length just to get the wheel back – very frustrating. Matt is here but slides back on the first of the hills and yo yo,s for a while before taking a break to regroup and get the next bunch. Maz appears on the uphill through Tarnagulla, limit must be getting a wriggle on. The race settles into the familiar, just keep going, check up the road – nothing – and Bill announces clear behind. It is not until approaching the sharp right at Newbridge that there are riders up the road but right on the turn a big bunch is swarming past. Say a quick word to Richard who seems to be going Ok and there is Shaun. So that’s everybody back to the 7:30 bunch which was their bunch. Can’t see Bob but there are riders all over the place. Here is Graeme at last but still no Ray – game over, come back another day. Just as slip off the back as Scratch motors by Tony, check, Andrew Rushton check (cannot miss him in the club uniform), Darren check. Didn’t actually see Phil but he was there too. Ray’s legs explode when he gets out of the saddle a few km from the finish and then the lights go out – so near yet so far. The race just a few km too far. Lisa has struck a tough day for her first open but has aquitted herself brilliantly and has averaged just a tick under 30kph – well done. Richard relates how he suffered severe leg lock 200 metres from the finish – first time he has suffered cramps – a rather brutal day all round. Darren does not have kind words for his bunch. John Creek it seems hung in there but the day was certainly not Ballarat cool. Can somebody else give us the view from a bit further back to complete the picture. This will take a few days to recover and it will be hot until Wednesday then cooler for next week at Warrnambool. The way I feel at the moment some rain would be nice. Richard Taylor, John Creek and I (Shaun Terry) set off in the 7.30 minute bunch. A solid pace was set from the beginning with each member of the bunch coming through doing their fair share of work. Not too far into the race and a couple of guys started to sit on and due to a lack of talking gaps started to appear within the bunch. From that point on there was no real consistency within the bunch and doing turns sometimes meant that you had to pass three riders to reach the guy who was currently doing a turn and then roll over the top of him. Big John Creek who was unfairly handicapped bombed through when he could and Richard Taylor pulled strong turns most of the race. Shaun Terry was all over the shop trying to find some sort of rhythm with the wheels he followed. The 7.30 bunch maintained a good average speed and even though it wasn’t fluent it started to catch bunches ahead. As a result a big bunch developed and it was full speed ahead in an attempt to catch the remaining bunches or riders out front. I said a quick hello to Terry Collie who was in the 16 minute bunch and spotted Bob Morely sitting comfortably on someone’s wheel. After turning the sharp right hander and having 10 km to go I could see scratch, including my brother, Darren a short distance behind. Not long after this saw scratch hit the front as the last surving rider, the never say die, Ray Hodgson was caught. Richard Taylor still looked very strong with 5 km to go, and was positioned well. John Creek and Terry Collie must’ve fallen off the back. Bob Morely was still there looking like he was ready to pounce. Getting closer to the finish and all of a sudden Andrew Rushton launched himself down the outside only to surrender shortly after. Phil Cartledge and Tony Mirabella were in a good spot to make a go of the finish. The pace heated up for a sprint. I missed the kick which wouln’t have mattered, because no way do I have the legs to match those scratch riders. Richard cramped up and couldn’t continue his sprint. I was able to muster an effort that saw me finish not too far behind the last of the more fancied riders. All I can remember was that that final 200m seemed like an eternity. In summing up, Richard Taylor rode a very solid race, John Creek did the best he could after being unfairly handicapped, and I can be happy with my result after being over worked early and still being there at the end. Great Race!!! Up at 0540 and a quick breakfast while making a jam sandwich to eat on they way up the highway. Meet Darren and Shaun at Richard’s place and we set off. Traffic is light and we arrive a bit before 0845 and off to see Mary for a number. Check the program, 22 minutes and I’m pleased as expected to be at least a bunch further back. Shaun’s got 12:30, Richard 10:00 and Darren 7:00 (third scratch). Scratch is chasing 4:30 to second and limit is 37 minutes. Already it is starting to get hot, get togged up pin on the numbers and today is a two biddon day. Out with the pump, 130 psi today as from memory the roads are not too bad. Now warm up – not too much today just need to spin up the legs as I don’t think 22 will be blasting off the mark. Usual story try to get the message to the bunch that we need to talk. So were off. A K or so of flat then the rode starts to rise must be careful the bunch does not implode within the first few kms. Lost one already then Allan Barnett disappears – four are working – Kay Huggins is riding well. And so it goes, up hill and down dale (there is not much actual flat road here). The course is a bit like the letter p. Head out to a right turn then three circuits then back into town. We pick up riders one at a time, always only a single rider, those in front are falling apart so it is imperative we hold together. Into the second lap just before a nasty little pinch “a bunch is coming”. Let’s get over this steep little pinch before we get caught. That done and they are no closer and we are not caught until the top of the long sweeping climb. Ok one lap to hang in with these guys from 18:30. Good Lord Allan Barnett is here and working some turns, he must have come good. Pace is solid but feel Ok and seem to go up the hills a little better than most and no word of a bunch behind. So now we are virtually on the home stretch, one last hill to go. It lights up at this point but fifteen or so make it over the top. Not sure of the number as am too busy to look behind. Somebody has gone solo off the front and no frantic chase. Then we are in the little dogleg over the rail line and the sprint has already started. How many in front ? I reckon I must have got 8 9 or 10, did not have a whole lot left. The guy off the front has stayed away, good for him – it was a bold move. Roll down the road and turn around ahh there is Shaun, Darren and Richard. Back at the start line and here comes scratch. Watch Leigh Egan give a demonstration as he gets the time by five lengths. At the presentations they say he has never been beaten for the time in a Vets Open -what a machine. 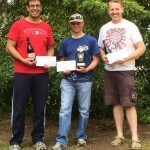 Winner averages 34.4 and scratch 40.97 not bad for a hilly course. Now that we have stopped the perspiration starts in earnest, wash, have a can of iron bru keep washing with the face washer, have a can of Coke, wipe face again. Eventually the body normalizes and we go in for the presentations. Cannot get licence back yet as Steve Auld has hit the deck and Mary and Harry are still out with him. Sounds like he has done some damage. 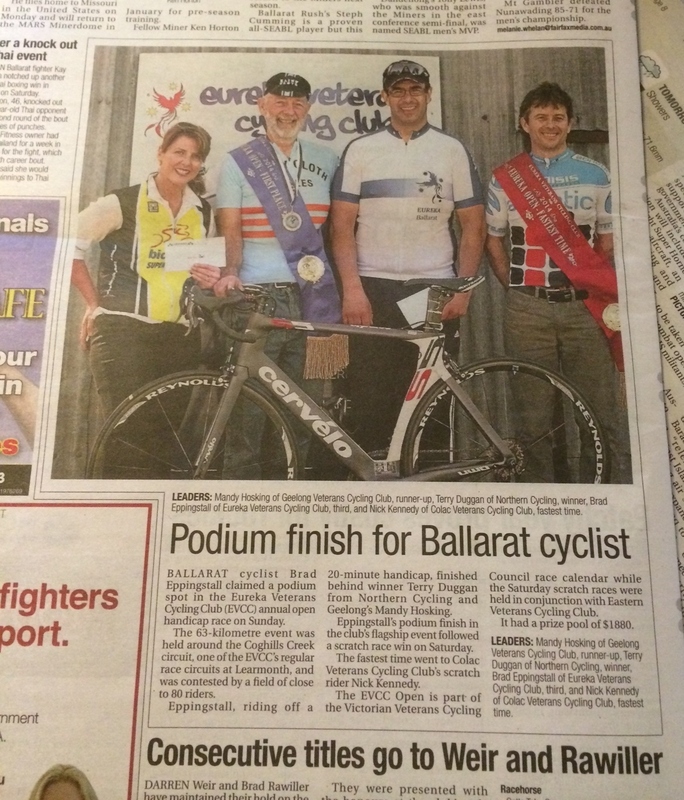 Take a wrong turn on the way back so we go home via Euroa but all are satisfied with a tough ride. Bendigo in two weeks.